This article has 6 pages. You're on page 4. This is what's it's all about: one shooter, one rifle, one round per target. Make it happen. Austin engages targets on the South Course, stage 6. The 2010 Steel Safari match was awesome to say the least! The Steel Safari match staff put on an amazing event. Thanks to them for putting in all the hard work and effort to make this match what it is. The match sponsors were awesome! There was an amazing prize table. Barrett and Thunder Beast came through especially big. Barrett gave away one of their REC 7 gas piston AR carbines, as well as some rings and a bag of stuff for every competitor. They also brought in a 98 Bravo and ammo as part of a bonus stage during the match. Thunder Beast Arms had several suppressors up for grabs on the prize table. They also provided the suppressor for the 98 Bravo on the bonus stage. The rest of the sponsors were great as well and provided a lot of awesome prizes! I shot the Safari last year for the first time. I had a great time and learned a lot. This year was much of the same. This year I shot the match with a 7 mm WSM which made shooting in the wind a little bit easier than last year, when I shot a .308. The match had plenty to keep me on my toes this year even with the calmer winds. (This year the highest gust I read on my kestrel was 19 mph.) The varied shooting positions from a stone structure to trees, shrubs and rocks were more than challenging for me and my WSM - as was the record heat of 109 (also from the kestrel). I learned this year that it is way more about the shooter than the caliber. As I got beat by some fellow shooters wielding .308's. I learned it's time I got out of "square range" attitude and practiced shooting in a lot more shooting positions than just prone off of a bipod. Lastly I learned that no zippy caliber is going to make up for a lack of practice. So if you are interested in a field style match where you carry all your gear, fight the heat and winds, find and engage unknown distance targets in a time limit, than this match is a must attend! 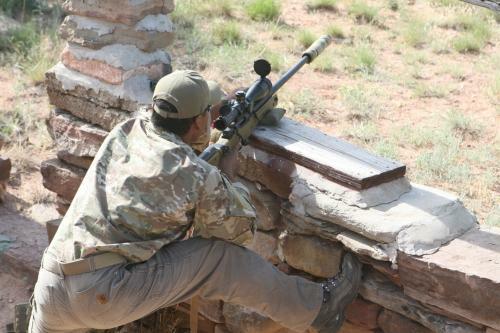 Jimmy Holdsworth is a master at using improvised stable shooting positions in the field. I would consider this match to be the pinnacle of any field type precision long range match I have ever shot. The setting camaraderie and facility are all world class. This year the course was changed up a bit from past years, with new shooting positions and more non traditional type shooting positions which I like. The wind was tricky ,and hard to find at some stations during the course, but I managed to figure it out almost halfway through the south course. I had heard of some high numbers coming from the couth course and this side was my favorite so I wanted to do better then the day before. With the weather predicted to be in the 100's, I prepared for the days to come, by hydrating and repacking my gear to just have what I needed for the days to come. 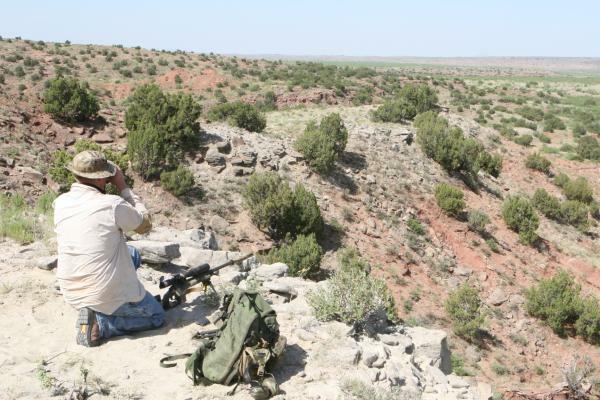 Carrying 4 bottles of water, ammo, LRF and rifle, I set out on the north course the first day. My numbers were respectable and missed some very easy shots and hit the more difficult ones which was frustrating. On the second day I started out terrible and cleaned the remaining 5 stages which felt good. The winds were tricky and I found myself holding too much wind, all windage holds were never off the plate after that. The winds were a full value at times and for me never exceeded more than that. My finish was very respectable and I was surprised on how well I did. With all the shooters there it was anyone's game and being in the company of so many world class shooters is a great feeling. 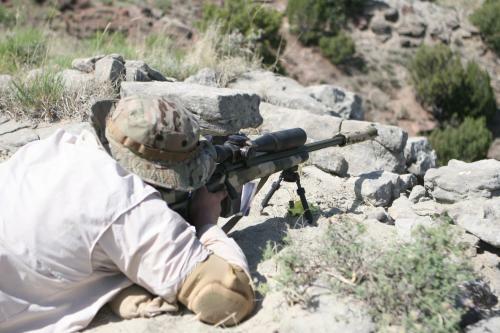 So if you're thinking of driving precision rifles at some serious ranges, this is the match for you. And I'd much rather be here then on the square range. I would like to thank Steel Safari, LLC and everyone involved in support of this match. The sponsors were awesome with donating product and of course I would like to thank the Wheeler's for having us.